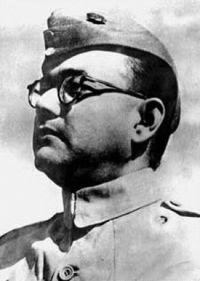 Today 23rd Jan. 2010 is the birthday of India's great freedom fighter Subhash Chandra Bose. So, today we are telling his qualities. He was Brilliant Student, ranked 4th in whole UK Civil Service Exam, good looking, great orator. He was the master in Hindi, Urdu, Begali, English, German and many more languages which he learnt for fighting with Gore English people. He was the greatest leader who united all Indians against the foreign rulers, formed the first Indian﻿ Army. He was a real HERO of INDIA. He was not a beggar, he was a soldier. He believed to treat the BRITISH with an iron fist. He did not want to gave british a safe passage to get out of india. Netaji Subhas was the greatest petriotic leader. Even today no one can come near to his petriotism. if he was the prime minister in stead of Jawaharlal﻿ things would be changed. U.S.A, china no one could come near to us. He was what most people﻿ would consider a great revolutionary hero in terms of military and intellectual strength. Netaji is the greatest son of India, supreme patriot. Nehru pygmy dared to declare Netaji as dead even when Netaji was alive, and insitituted fake commissions to that effect. And he secretly passed on information about Netaji to the Brits and ensured he﻿ did not step into Ind. If He was able to bring liberation by force, India will never be divided and robbed by Brits. Netaji was one of the first two criticize﻿ Hitler's treatment of jews. He did not sympathized with the Nazis. He may be called the true architect of﻿ India's independance. 100% agree with all your statements on Subhas Chandra Bose. Alas few Indians know this.